Lucy van Pelt is a formidable character in the Peanuts Gang. She is headstrong, opinionated, and bossy, yet she has a good heart and she can show compassion. There are some good lessons to be learned from Lucy and these are a few of them. Don’t settle for being average – Lucy believes in going beyond the status quo. She is unique and stands out in her abilities to be a group leader. As she says, “What shape would the world be in today if everyone settled for being average?” Kids can learn from Lucy to be better than just average. Be practical – Lucy has a very practical side about her. She can be no nonsense and straight to the point about situations. Practicality has its place. Be willing to compliment others – Lucy is always hard on Charlie Brown. She constantly teases him and calls him names. But occasionally she has something good to say to him. In the film, “You’re a Good Man Charlie Brown,” those are the words she says to her friend at the end, confirming for him the fact that he is indeed a good man. Compliments lift the spirits and encourage others. Be a good listener – Even though Lucy doesn’t always give out the best advice, she does take the time to listen to her friends troubles. She charges a nickel for her time, but at least she is willing to lend an ear. Being a good listener is a worthy skill to develop. Girls are strong – Lucy has a way of throwing her weight around, and she often seems to be the leader of the pack. She’s not at all timid. Girls who want to grow up to be leaders can learn something about being bold and outspoken from Lucy. Of course, you don’t want your daughters to develop Lucy’s bad habits, but learning how to be assertive in a positive way is definitely a plus. Be kind to others – Lucy can learn a little about being kind to others, especially when it comes to Charlie Brown. She’s developed a habit of being unkind toward Charlie and only sometimes does she manage to rise above it. Constantly teasing and making fun of someone, whether a friend or a sibling is not a good thing. Kids need to learn to be kind and treat others the way they want to be treated. Develop a good attitude – Attitude makes a huge difference in a person’s life. In the film, “You’re a Good Man Charlie Brown,” Linus gives Lucy a crabbiness test and she comes out with a rating of 95. After she slugs Linus for telling her the rating, she realizes what a terrible crab she is. A good attitude makes for a much happier and successful life. 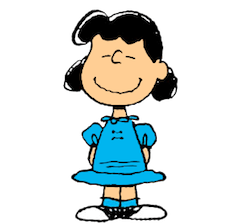 Be a good big sister – Lucy is big sister to Linus and Rerun. Lucy gives Linus grief over his blanket every now and then, but she does care a lot for her younger brothers. Being a big sister is a huge responsibility. Everybody has a weakness – Lucy is a strong female and usually has it all together, but the one person for whom she has a major soft spot is Schroeder. Her love for Schroeder can make her do nutty things. Everybody has a weakness, but recognizing your weakness and doing something about it is not something everybody manages to do. Learn to face up to your weaknesses and don’t let them rule you is another lesson to learn from Lucy. Lucy has her foibles as well as her strong points. The lessons that can be learned from her can enrich a kid’s life in many ways. From developing a pleasant attitude to being a good role model, learning from the positive and negative aspects of Lucy’s actions can make a difference in a child’s life.